Also known as "The Black Rider" or "The Headless Rider," she is a Dullahan from Ireland who came to Japan looking for her stolen head. Her motorcycle is actually a horse in disguise. She has no heart and perceives surroundings via unknown sensors that are not located on the head. The physical strength she possesses is above human, though not quite on par with Shizuo Heiwajima. She is also capable of manipulating a shadow-like, durable substance to form objects ranging from gloves to chariots at her will. 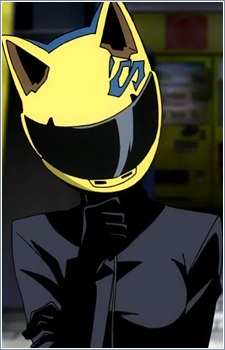 Celty lives with Shinra Kishitani and works as an underground porter. She wears a helmet when she goes out and communicates via a PDA. She enjoys online chatting, television and DVDs. She is one of the minority who knows the creator of the Dollars. She seems to have feelings for Shinra, but she herself is unsure if it is really love. She tends to get mad when Shinra says she does not need her head. She is afraid of movie scenes such as being chased by extraterrestrials or traffic officers. Her head is also shown to have auburn hair and green eyes the few times it is shown on screen. Her online chat screenname is "Setton."